This paper won first prize in the 2001 Canadian Student Writing Contest - English category. In The French Lieutenant's Woman by John Fowles, Doctor Grogan exclaims while conversing with the main character of the novel, Charles Smithson, "Between ourselves, Smithson, I'm an old heathen. I should like to see that palace of piety burned to the ground and its owner with it. I'll be damned if I wouldn't dance a jig on the ashes." It's interesting to note that the esteemed doctor, after claiming to be a heathen, would celebrate the incineration of a house with a jig. According to Meredith Little's research on the history of the gigue in the New Grove, "literary references suggest that jigs were fast pantomimic dances . . . with lively rhythms created by virtuoso footwork, and that they were somewhat bawdy . . . most 16th century connotations of the English word 'jig' were vulgar." Dancing in the face of someone's misfortune would be cause for scandal in itself, but to do a 'jig' would be the height of English mockery and crudeness. Although John Fowles probably didn't study the history of the gigue, he knew enough to intimate that it was an energetic, exuberant and even, as implied by Doctor Grogan, liberating dance. A more straightforward and exact definition of the gigue comes from the New Grove article: "One of the most popular of Baroque instrumental dances and a standard movement, along with the allemande, courante and sarabande, of the suite. . . . Although 17th century gigues were notated in simple duple metre, most are in some kind of compound metre (i.e. with a triple subdivision of the duple beats), and most are in binary form." Note that Little, in reference to metre, uses the word "most," for a few exceptions to the rule do exist. Johann Sebastian Bach composed a total of forty-five instrumental gigues, all of which are in ternary notation save two, which are written in binary notation. 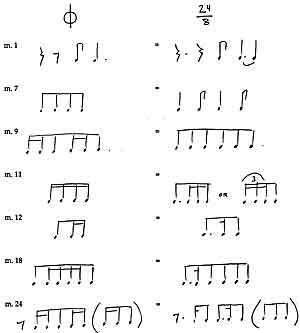 "Perhaps the most puzzling of all rhythmic conventions," comments Howard Ferguson, "is the use of written binary rhythms to stand for ternary rhythms. Primarily this means using binary notation (e.g. 3/4) and ternary notation (9/8, or triplets in 3/4) in a single piece, and relying on the performer to reduce the whole to ternary rhythm." The two "black sheep" binary gigues can be found in Bach's works for keyboard, the French Suite No. 1 in D minor, BWV 812 and the Partita No. 6 in E minor, BWV 830. We will try to show that although Bach published the gigue from the sixth Partita in binary notation, it may in fact have been intended to be performed in ternary. Ferguson provides us with an ideal example of this dilemma by citing the courante of Bach's French Suite No. 4 in E flat. It is a baroque convention to interpret the dotted eight-sixteenth note combination as a triplet in a piece in which triplets are common. In 1657, Johann Jakob Froberger was using the gigue as a standard second movement in his keyboard suites and is credited with having popularized the form in Germany. Thirteen of Froberger's gigues are written in binary notation and, according to Ferguson, it is supposed that they were nevertheless to be performed in either 12/8 or a very quick 3/4. A fascinating example from Ferguson supports this theory. These two gigues are identical except for a change in time signature. The composer's autograph of Suite VII of CE (1656) has the gigue in common time. In a later publication (1660�70), the same gigue appears with four three-beat measures in place of each measure of the earlier version. 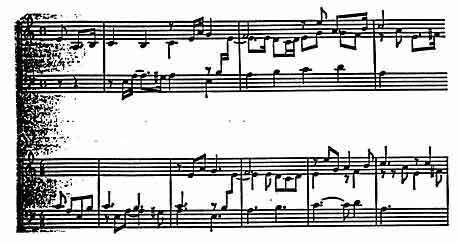 The later gigue belongs to a different suite (XXIII of CE) but is obviously the same piece in spite of the change in metre. The same example is used by Michael Collins in his article "The Performance of Triplets in the 17th and 18th Centuries," but he adds another Froberger gigue to the argument. As in the previous example there are two versions: one an autograph by Froberger and one from a later source. The second version has two 6/8 measures in place of one measure of the original 4/4. Although the Froberger autograph is considered the more authentic source, "in both cases . . . the version in ternary rhythm seems to be someone else's idea of how Froberger's gigues ought to be notated. What we see in these examples is probably not a rhythmic transformation, but different methods of notating a single ternary rhythm." The relationship between composer and musician in the 1600s was very different from today. Composers worked directly with performers, allowing for a freedom in notation and performance that is impossible for most classical composers and players now. Froberger probably expected to work closely with the performer and therefore wrote the gigue out in binary, intending to show the performer how it was to be played�supposing it really was to be performed in ternary rather than binary. 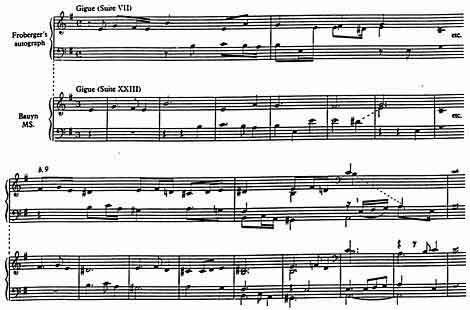 Even though Froberger notated the gigue in binary, he may also have expected that contemporaries would be familiar with the style in which gigues were performed, regardless of the score. This conclusion seems to be corroborated by both of our previous examples. Froberger and Bach were not the only composers to write gigues in binary form. "The problem [also] exists in the gigues of numerous earlier and contemporaneous composers such as Denis Gaultier, Arcangelo Corelli, Froberger, Kuhnau, B�hm, and Johann Mattheson; the practice goes back well into the seventeenth century." 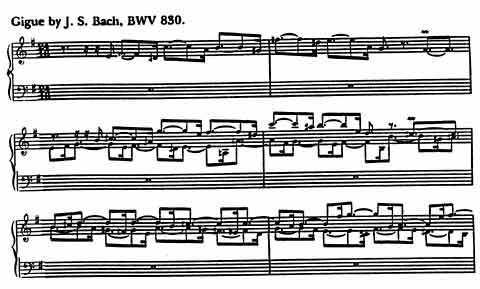 Bach wrote the gigue from the sixth Partita at a time when writing gigues in binary notation was rare but not unheard of. It is also important to note that the gigue, before 1693, was not always at the end of a suite, as in Bach's compositions. In 1657 Froberger employed the gigue as the second movement in his suites, typically after a duple allemande. However, by 1693 the gigue had been relegated to the end of the suite, usually after a ternary sarabande. Certain French lute composers, such as Gaultier and Perrine, considered the gigue and the allemande interchangeable. "Beginning in the works of Ennemond and Denis Gaultier, several pieces entitled 'allemande gigu�e' or 'allemande en gigue' appeared. The explanation for this curious labelling comes from Perrine's indication in the Pi�ces de luth en musique (Paris, c. 1680) that two allemandes were to be played 'en gigue.' Following each is a transcription of the allemande 'en gigue' (in fact, the pieces are relabelled 'gigue') in which the even quavers of the original have been altered to dotted quaver and semiquaver figures." In the preface to his edition of Gaultier's La Rh�torique des dieux, David J. Buch comments on how Gaultier's suites "include the following dance types: pavanne, allemande, gigue (not always distinguishable from the allemande in contemporary manuscript sources, which sometimes give both names as a title)." Louis Couperin, in his allemande La Laborieuse (Ordre 2), suggests that it should be played "Sans lenteur, et les doubles croches un tant-soit peu point�es." McIntyre believes that Couperin meant to say "that the sixteenth notes should be only slightly dotted�not so much as to produce the characteristic triplet rhythm of the gigues." It is clear that Couperin wanted to dissuade performers from doing what he expected they would do automatically: change his allemande into a gigue by dotting the sixteenths. The time signature Bach used for the gigue from the sixth Partita consists of a circle with a line through it, or better put by Ray McIntyre, a "barred circle." Johann Walther's Musikalisches Lexikon gives us an idea of what the time signature might have meant for Bach. "O this letter is properly a circle and the sign of tempus perfectum, whether it stands alone, or is written with a dot in the middle thus: or with a line drawn through it thus: �. With our forefathers it was always the sign of triple time, because they claimed that a ternary number was more perfect than a binary number and the circle was best suited to point out the triple division, because it is the most perfect figure." Note, however, that tempus perfectum originally meant three beats to the bar, rather than a triple division of the beat. The Partitas were published under the title Clavier�bung in 1731 and Walther's Lexicon was published in Leipzig only one year later. Walther's definition of the symbol was probably common knowledge for musicians in his time (as ours is today of the time signature C), and it is likely that Bach was also acquainted with the ternary significance of the symbol he employed. "It is clear that Bach's use of the barred circle confirms the triple rhythm of the gigue, the notation to the contrary notwithstanding." Interestingly enough, Bach's version of this gigue in the "Notebook for Anna Magdalena" is written in 4/4 with the notes half the value of the published version. It now seems clear what the barred circle meant for Bach as a time signature. How was a gigue defined in his time? Meredith Little gives us with a contemporary definition, but how exactly would an eighteenth-century theorist define the form? Brossard, in his Dictionnaire de musique, published in Paris in 1703, states: "GIGA or Gicque or Gigue . . . is a tune ordinarily for instruments, which is written almost always in triple time, and is full of dotted and syncopated notes which make the tune gay and, so to speak, jumping, etc. . . . The Italians usually indicate the movement of the gigue in 6/8 or 12/8 time for the violins and sometimes with the sign of C or quadruple measure for the bass. The bass is played then as though it were dotted." Brossard mentions, like Little, that the gigue is written "almost always" in ternary notation, although in binary notation "the bass is played then as though it were dotted." This seems to imply that even if the gigue was written in eighths, the correct execution would be to play triplets or at very least, in a swinging style. So how does a performer ultimately interpret Bach's baffling binary gigue? The majority of players, it seems, choose to play it as written. Angela Hewitt, Glenn Gould and Gustav Leonhardt adhere to the original score. The Hewitt and Leonhardt interpretations are rather straightforward, while Gould's recording manages to dance despite the duple metre. Trevor Pinnock, Kenneth Gilbert and Andras Schiff choose the path less taken and transfer the duple metre to triple. Ferguson goes on to say that his table "leaves room for individual variation in details of interpretation; but this is scarcely surprising in a tradition depending entirely on extemporary application." The three triple-metre recordings reveal that the exact process of changing the rhythms depends on the performer's taste. Schiff chooses a creative style of interpretation by constantly altering rhythmic choices and not allowing the score or Ferguson's table (with which he must have been acquainted as a scholar) to dictate the exact transformation. Even Walther has his own idea of how to interpret a certain passage from this gigue. "Walther writes in measure 11, where Bach has four sixteenths (Ex. 8a), a triplet of sixteenth notes followed by an eighth note Ex. 8b)." "Inasmuch as the player has a choice in adjusting four sixteenths to fit triplet rhythm he might wish to vary his method from group to group within the same measure or from performance to performance." Ferguson transcribes the first few measures of Bach's gigue from its binary form into 24/16. Little and Jenne offer their suggestion in a complete score of the gigue. "Often there is more than one way to incorporate tripleness, and performances will inevitably vary. . . . Ex. X-18 presents our resolutions of the gigue from BWV 830 and may serve as a guide for the adventurous." To do or not to do . . . There are a number of reasons both for and against the performance in ternary of a gigue written in binary notation. First, historical evidence suggests that it was to be performed in ternary, and both notational and theoretical sources point towards the "tripleness" of the gigue in general. Present-day theorists such as Ferguson, Little, McIntyre, and Collins have compiled historical proof which is hard to ignore. On an interpretational level, it could be supposed that if the gigue was meant to be an energetic dance, then a swinging, triplet rhythm would be more in order than an angular, duple rhythm. And as Little states, "a guide for the adventurous" is the perfect way to imply that interpreting the gigue in ternary is a little like walking on uncharted soil: it's exciting to imagine just what might come of the journey. After all the information is collected and researched, is it possible to come to a concrete conclusion? The evidence given doesn't establish conclusively which performance is correct: binary or ternary? We know that Bach supervised the engraving and printing of the six Partitas, so the question to ask is, why wouldn't he have changed the gigue to ternary before it went to the engravers? Perhaps he wanted his two binary gigues to remain as he wrote them, standing out from all the others. Maybe he was old-fashioned, as McIntyre states, and wrote the gigues in binary according to an older tradition. Or maybe he didn't give a second thought to the idea that after 275 years his binary gigue would still have many musicians, theorists, and musicologists turning intellectual somersaults in order to solve the puzzle. Perhaps if he had envisaged this, he'd have taken it upon himself to make it a lot easier for those interested!